Jimmy Sturr and His Orchestra play a bunch of music on this Live-In Person DVD! PolkaConnection.com recommended! One of the Best DVDs we sell! Jimmy Sturr and His Orchestra recorded a live PBS TV special. 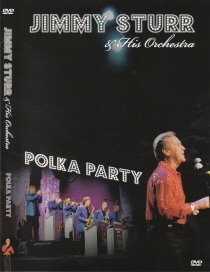 “Polka Party” is the title of the program. There is much great “Live” music on this DVD. Don’t Pass International Polka Music Hall of Fame® Jimmy Sturr and His Orchestra on this quality DVD. This is one of the best domestic DVDs to come out in years! Special guest of button box accordion is Kathy Vogt.